As the diesel-powered Nissan Patrol was growing in popularity, Toyota needed another home-run for their own diesel fleet. Drawing on design elements from the enormously successful “L” series diesel engines, Toyota wanted their new diesel engine to be a complete re-design; sharing not even the engine block with their previous engines. 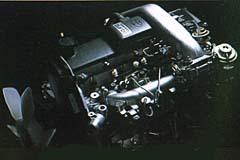 In 1993, Toyota released the 1KZT-E to critical acclaim worldwide. It featured a turbocharged, large displacement 3.0 (2,982 cc) liter 4-cylinder diesel engine with an electronically controlled indirect injection system. Worldwide, the 1KZT-E has earned a cult-following for it’s dependability, longevity, and economy. Even though it was released in 1993, Toyota is still producing the 1KZT-E in certain markets.